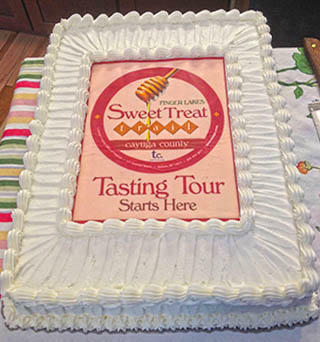 April 23, Cayuga County, NY – The 2015 Finger Lakes Sweet Treat Trail Tasting Tour will kick-off on May 1st from 5 – 8 pm at the Hilton Garden Inn, Auburn as part of First Friday, a community open house coordinated by the Auburn Downtown BID. This farmer’s market style event is free and family-friendly, offering samples and tastings of locally produced baked goods, jams & jellies, honey and maple syrup from many of the 20 sweet spots on the Trail. Sweet Treats tastings will be provided by Auburn Farmers’ Market, Karen’s Country Confections, Carolyn’s Creations, Strawberry Fields Hydroponic Farm, Standing Stone Honey Bee Products, New Hope Mills, Prison City Pub & Brewery, Reese’s Dairy Bar, Dorie’s Bakery, Smokey Hollow Maple Syrup and the Hilton Garden Inn. The 2015 Tasting Tour Brochure & Pass to all of the participating sites will be available for pick up at the event so you can start planning your own personal tasting tour!